Bet I cannot buy just one! Well I have just entered the exciting world of collecting notes, currency, or paper money as it is called in the trade. I recently purchased 89 notes graded by CGA the olde, and as we all know that holder is not from the promised land, but a grader which fell into the lower regions for various reasons. I got two books on paper money; my favorite so far is the Whitman Encyclopedia of U.S. Paper Money. My send favorite is Paper Money of the United States by Friedberg. There is a third one which I use at shows for quick ID&#39;ing and evaluations. Unfortunately, like Morgan Silver Dollars, there are so durn many varities of monies that it is a challenge every day trying to figure the value of odd notes. This first foray into paper money began with a small collection purchased from a fellow who was changing horses mid-stream so I relieved him of the 89 pieces. There were 65 of the 89 worth re-grading and I just got back the main stash information today, and will receive them physically in the mail in a day or two. I will then upload pictures and complete phase two of this journal with as many pictures as I can raise up. The excitement here is in the fact these notes are of special interest due to special serial numbers, star notes, signed notes and so on and so forth. 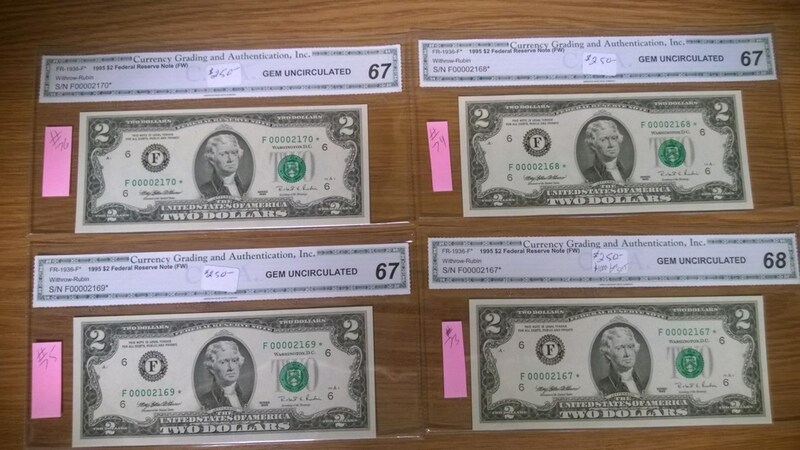 Four sets of them, 12 each, are one from each district with exactly the same serial numbers. One set is particularly captivating in that not only are the serial numbers all the same, but one from each district, and the serial numbers are 00001111. Some computer geek will slobber all over the album just ogling it. Two more of the sets also have neato serial numbers, and one from each district and the fourth set, my favorite, is one which has one from each district, and the serial number 00000039 plus they are star notes, all of them, and the fact they are signed by the mint director also. The others which I shall talk about later are all fun, and some more beguiling than others. Well, happy searching hope you find a treasure soon. The picture is pre-PMG grading, I will change it later.